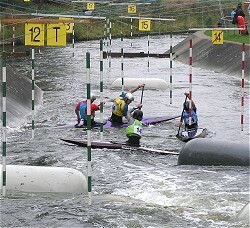 In association with Beds and Cambs Wing, the Squadron has been given places for up to 14 cadets to get a taste of white water kayaking next weekend, 7-8 July 2012. Saturday will see everyone help set-up the course, watch the interpid staff member test it, and then undergo some familierisation training with the kayaks on and off the river. In the evening, we'll be camping out next to the river - but as there is no cooking allowed on site, everyone will have a great excuse to buy-in some take-away pizza or fish and chips to enjoy as the sun sets over the river. The real adventure awaits on Sunday, when everyone will hit the water to battle the rapids and obstacles along the course. The cost of the weekend is just £7, to be paid in advance, plus spending money for the evening meal. Packed lunches will also be needed for Saturday. A full kit-list will be issued on Sunday (nothing unusual, all specialist kit is provided). Those who wish to go on this exciting course must bring in consent forms (CC1, CC3, and if required CC4) and payment (cash or cheque for £7) on Sunday 1 July - places are limited, so get in!